Fig. 1. Discocactus alteolens in the Abbey Garden collection (imported by Su-ka-Flor). Several days before the modern German-made "ferrobus" would take us on a quick journey all the way to the Brazilian border, we had to book our tickets in Santa Cruz. The contraption that we call in Germany "Triebwagen," consisted of two passenger carriages. Soft drinks and meals were served on the train. With me I had two Aguaruna Indian lads from Peru where I did missionary work. These precious boys had become sons to me; they were hard workers, with excellent behavior, and their interest in botany was contagious. Considering that their grandparents still shrunk heads, they had come a long way. 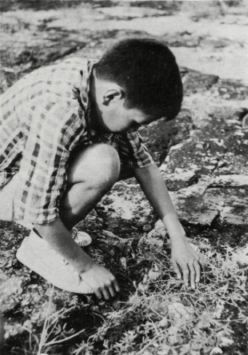 The purpose of this journey was the study of various genera and species of cactus which had been discovered in recent years by a Franciscan priest of Tirolian descent, Father Hammerschmidt. In order not to have to run the risk of crowded trains and delays in the various stations, we booked the ticket straight through to Puerto Suarez on the Brazilian border. We wanted to take our time returning. The journey was hot and without important incidents. On this fast train there is little to be seen when it comes to definite cactus species. Apart from one short stretch near San Jose de Chiquitos, where there are some very interesting and abrupt rock formations, the land was rather flat. Population centers are few and far between, and apart from San Jose and Robore they are very small. No wonder that the Ayoreo Indians have in years past attacked the train with bow and arrow. This tribe is very small and nomadic so that very few people ever have seen any of its members. A more friendly group has been contacted by an American missionary in Camiri and are largely evangelized. Fig. 2 (left). Discocactus heptacanthus (see page 216) in the "lajas" of San Cyrilo, Puerto Suarez. Fig. 3 (right). 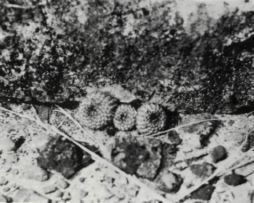 Discocactus alteolens in habitat. Fig. 4 (above left). Frailea chiquitana in the "lajas" of Santiago. Fig. 5 (above right). 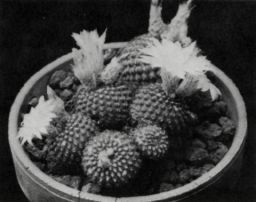 F. chiquitana in the Abbey Garden collection (from the firm, Karlheinz Uhlig). Puerto Suarez is very small, and the people are very friendly. Soon I was approached by a young man who was watching like myself a performance of callisthenics of the local High School. The evening breeze was very refreshing. When he heard that I wanted to visit the area of Cerro Mutun, he told me that he was very familiar with this district, in fact with all of the wilderness all the way to the Paraguayan border. He had a jeep and volunteered to show me the place the next morning. As we left, the heat was already simmering. Soon we almost collided with a small monkey on the dirt road. Then we saw the hill approaching quickly, the biggest deposit of iron ore mined in Bolivia. Half of the mountain is in Brazil. There was a beehive of activity as preparations were being made to start working soon. We were stopped by a guard who tried to prevent us from going any further, but my friend was known, and an exception was made. 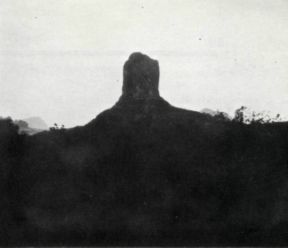 Soon we arrived at large flat iron ore beds, called "lajas". And then, for the first time in my life, my eyes beheld thousands of Discocactus alteolens. I was sad at the thought that practically all of these precious and interesting plants would soon become victims of the mine. We started collecting seeds, but it was not the time for that. Plants for several universities and botanical gardens in Europe were collected, but all with the cephalium barely starting, as more mature plants will root very rarely. 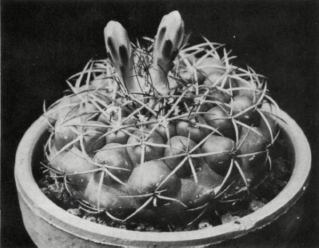 When I first saw the plants from a distance, they resembled Gymnocalycium, but then I saw the cephalium. In the glowing October heat we were soon tired; the plants were loaded onto the jeep, and we were heading for San Cyrilo, about 16 miles distant. My friend was quite amused when I asked him to take me to San Cyrilo, and his surprise was great when that name was found in the Kakteen-Lexikon of Backeberg. There is not a single house, but soon after leaving the jeep, we saw the "lajas" and quickened our steps. Fig. 6. 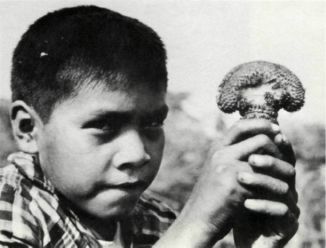 Wilfredo Cunachi, an Aguaruna Indian, pointing out Frailea chiquitana. Fig. 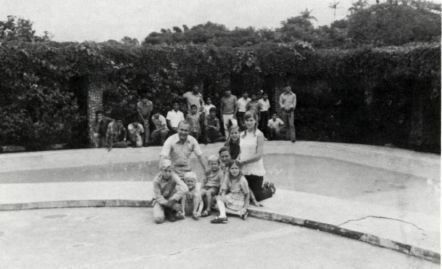 7 (left). 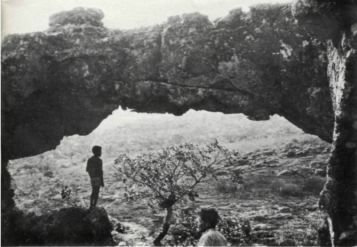 Wilfredo standing below a natural arch. Fig. 8 (right). A view from the train near San Jose de Chiquitos. Our enthusiasm was great to see these majestic plants of Discocactus heptacanthus. There was not much space left on the small Brazilian-built jeep, but some of these beautiful plants we loaded on to it. For my observation I took along plants with the tip of a bud showing in the cephalium, hoping that within a few days it might bloom. Who can describe my surprise when at 7 p.m. I looked into my small hotel room to see an entirely open white blossom? The neighbors came and wanted to see this strange flower. What, they said, you found it at San Cyrilo? Impossible. We live here and never have seen such a thing. Of course, the people did not realize that during the day it would be closed. A thunderstorm was close, but still through the flashing lightning the people came and wanted to see that sensational blossom. I was ready to take a photo at 6 a.m. when there would be enough light. But at 5:30 the flower had withered. It was impossible to acquire wooden boxes or newspaper to pack the plants. With no problems, within half an hour we reached Corumba, a very busy and progressive town in Brazil at the Paraguay River. We did not even have to stop at the border to show our passports. Returning to Puerto Suarez, we sent the box with plants to Santa Cruz, there to be picked up by a friend of mine. The next stop was Robore. With a friend of mine I made arrangements to travel to Santiago in order to climb the Divi Miserato mountain. When I touched the dinner table, it was hot. This was in the shade. Can you imagine the furnace outside in the sun? Life comes to a standstill. This area between the Mato Grosso and Gran Chaco is one of the most hostile and sacrifice-demanding areas in the world. Before the truck left for Santiago, I went to visit Padre Hermann in Robore in order to receive information about Father Hammerschmidt. He was very surprized. No, he said, you cannot see him any more, he died two weeks ago. The story was sad. In the difficult climate with a great amount of responsibilities, he mistook the bottle of sulphuric acid for his medicine when he got up in the night. He must have had a very painful death. Padre Hermann did not know cacti, but he advised me to visit Padre Klingler, whose name I knew through the quite common Echinopsis klingleriana. Fig. 9 (left). Frailea chiquitana in quartz-sand and "lajas". Fig. 10 (right). Wilfredo showing a crest of F. chiquitana. Fig. 11. My friend, the tapir. Around Robore Gymnocalycium damsii v. rotundulum abound. It grows in semi-shade beneath the shrubs that have no or very few leaves. The light filters through. Most of the plants were sick with fungus. I had to limit my collecting and concentrate on seeds. The soil is a rich sandy loam. Rains are frequent during the summer. The white blossoms were clearly seen from a distance. The journey to Santiago, which we made in about an hour, was very pleasant. It rained lightly, and even the 300 feet difference in altitude is a welcome change from the sweltering heat. We passed many wild amaryllis with big cream-colored blossoms. In some places appeared Echinopsis hammerschmidtii. There were lajas too, and as usual, they attracted our whole attention. 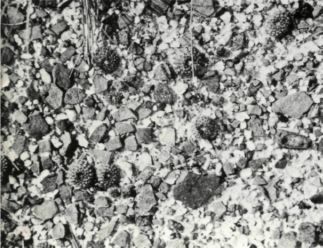 Out of the small crevices, and in quartzsand deposits grew thousands of delicate-looking Frailea chiquitana. Having read much about their cleistogamous flowers, I was surprised to learn that the blossoms open fully in direct sunshine in their natural habitat. Later, as I reached the top of Divi Miserato, I found that the variety growing there grows almost exclusively in very coarse quartzsand, in a soil that is almost sterile. I have never found out what Frailea pullispina is, as according to my own observations, I am inclined that all belong to the same species. 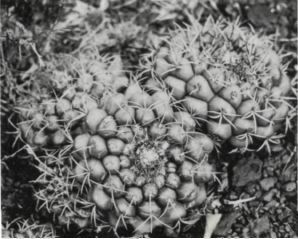 I found that small plants had the typical mamil-lae like Mammillaria, while the older plant had uninterrupted ribs, a little wider at the areoles. Also I saw yellow-green epidermis in the full sun and bluish in the semi-shade. Fig. 12. 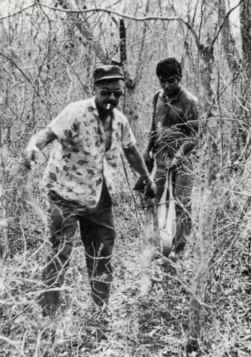 Two local helpers with an urina. However, I would invite any rectification of my statement in order to expand my little knowledge about this genus. A special attraction of Divi Miserato are several natural arches of exquisite beauty. May this virgin territory be preserved for a long time to come. In the home of a missionary friend of mine I saw a beautiful Gymnocalycium damsii with very light pink sepals, but with beautiful red petals. They had been brought from an area called Aguas Sucias, about 35 miles southeast of Robore. My first reaction was that they could be the variety tucavocense. Yet the region is a long way east of San Jose, and if the color pink could be applied, it would be a very dark pink. Not having a color-guide, I could not give the corresponding number. With a rented jeep I started off for Aguas Sucias. These trails are anything but comfortable. A friend of mine described the whole dry-bush of the huge area as a gray hell. 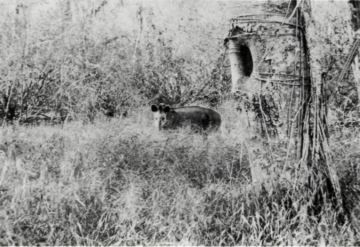 Soon we came to a water hole, where we scared off five swift urinas, a small and delicious tasting deer of the Gran Chaco region. Another animal was snoring in his siesta. From behind it almost looked like a donkey. But than as I walked around him I saw the trunk which identified him as an especially large tapir. I kicked him gently in his side, and he awoke. He did not seem startled when he saw me. Maybe I was the first human he had ever come across. He decided to sleep again and closed his eyes. He must have thought it strange to see me, so he opened his eyes again and very slowly arose and walked away. Soon we had to walk about an hour or so when we entered a zone with prolific growth of Echinopsis klingleriana. They demanded all my attention, and several times one of the hard spines penetrated my shoes. The boys stayed a little behind, obviously investigating something. When they at last reached me, they said in the typical Aguaruna fashion, without showing any emotion: "And this here, it is of any importance?" I must have walked over scores of neatly hidden Gymnocalycium damsii of the red-petaled variety. In their nonchalant observation they rebuked my lack of scientific recognition. I am always amazed when we travel over the narrow dirt roads in some canyon. Suddenly 10 year old Wilfredo will shout: A cactus! And what do we see. Maybe a Sulcorebutia 1 inch in diameter hidden in some crevice. But his eye sees it. With a cattle train, sitting uncomfortably in the caboose, we continued to Taperas, home of Padre Klingler. A great adventure began, which I have promised to write for the Journal in Great Britain. 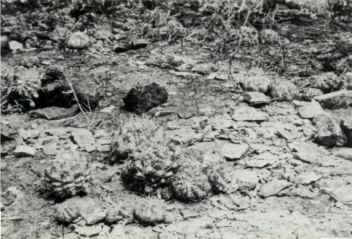 But we solved the mystery of the habitat of Gymnocalycium pseudo-malacocarpus, grieseo-pallidum and others. We are grateful that we got out of this area alive. Fig. 13. The author with friends and helpers.